Rare Labradorite Green (almost black) with black leather. New battery. Rear suspension spheres. New alternator. 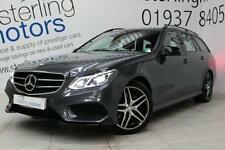 New listingmercedes e class 220 cdi estate face lift model!! 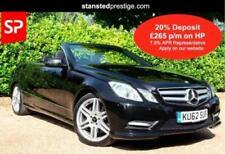 Excellent condition facelift model motorway milage one owner . No problems whatsoever any test, any test drive , no leaks no knocks drives as new . Any questions ask!! Grab a bargain!!! Mercedes 320E CDi 7 Seats, with partial service history, Has just failed MOT on rear suspension, However drives really well engine is great, Full Leather with all normal extras, Sold for spares or repair, as will make a great car with huge load or passenger carrying capability. Mercedes-Benz E320 3.2TD auto 2004MY CDI Avantgarde WITH FULL LEATHER INTERIOR! 2007 07 REG Mercedes-Benz E Class 2.1 E220 CDI Elegance 5dr "7 SEATER" ESTATE"
Trafalgar Motor Co - Call us on 441422417697 or click here to find out more. Full service history. Full black leather interior. 4 new tyres, gearbox and engine service last year. Full service history. 92k Drives, Fab Spec, VERY VERY Simple Repair! MOT till 12/2018. Paddle shifters for manual gearshift. 2007 on 56 plate, 118800 miles. Indium Grey with black leather interior. CD player. Multi function leather steering wheel. 5 owners in total. 2012 model bluemotion with colum change heated seats sat nav. For sale due to finishing uni and going travelling. This car has been in my family for the last 4 years. Cash on collection from HX7, Hebden Bridge area. Price is £1250, its is cheap for what it is. MERCEDES E320 3.2 ELEGANCE AUTOMATIC 4dr Saloon finished in Metallic Blue with a Beige Leather Upholstery. This vehicle comes with a Service History and benefits from an MOT until September 2019. Specification includes Climate Control Air Conditioning, Alloy Wheels, Cruise Control, Electric Memory Heated Seats, Panoramic Roof, Satellite Navigation, Auto Lights, Electric Folding Mirrors, Parking Sensors, Xenon Headlamps & CD Player. FSH Auto Petrol TWO Owner! !